From March 23 - June 16, 2019, the main floor Bunzl Gallery will launch the first in a series of annual exhibitions celebrating the creativity of fellows and students of neighboring arts centers. This year, The Bascom is proud to highlight works by fellows of The Hambidge Center in Rabun Gap, Georgia. 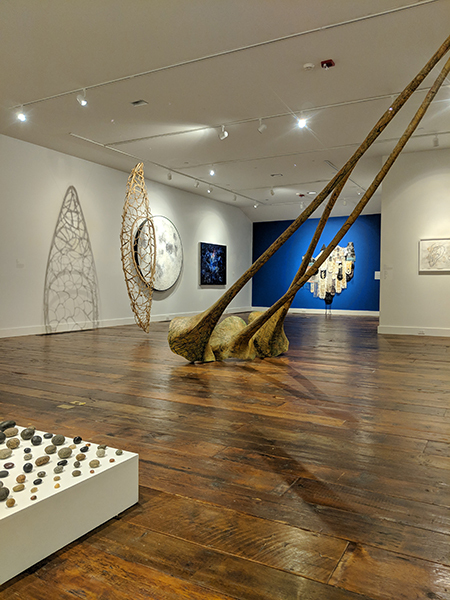 This exhibition, curated by Lisa Alembik, features artist fellows of The Hambidge Center whose works express a lucid connection with nature and a distinctive underlying structure, best characterizing an approach to compositional design inspired by the writings of Jay Hambidge. Interested in the mathematics behind the aesthetics in Greek architecture, Jay Hambidge is best known for his “rediscovery” of Dynamic Symmetry. In 1934, his partner Mary Crovatt Hambidge founded The Hambidge Center for Creative Arts & Sciences in Rabun Gap in his memory. As one of the first artist communities in the U.S., the Hambidge Center has a distinguished history of supporting individual artists through its residency program. The Bascom offers free admission to all exhibition gallery spaces. Guests may enjoy these exhibits during gallery hours, Monday - Saturday 10 – 5pm and Sunday Noon – 5pm. The Bascom would like to thank our year-round exhibition sponsors: Bel Canto, Cathy and Bob Fisher, Delta Air Lines, Ginger Kennedy and Kevin Naylor, Virginia and Mike Campbell, Chaparral Foundation, and Bobbie and Jon Golden; as well as our exhibit sponsor The Alma Lee, Norman and Cary Saurage Fund. The Bascom: A Center for the Visual Arts is located in Highlands, North Carolina. The Bascom focuses on providing excellent free admission exhibitions; a robust education department with art classes for people of all ages; and an expansive outreach program consisting of numerous partnerships with local nonprofit organizations. For more information about The Bascom, please visit www.thebascom.org or call 828-526-4949. Visit us in person at 323 Franklin Road Highlands, NC. The Bascom is just across the covered bridge!